Arizona safety Kerry Rhodes says teammate Patrick Peterson will never catch up with his confidence. In his second NFL season, Peterson does not hesitate when asked if he's already the best cornerback in the game. It's an attitude instilled in him while growing up in the football-crazy state of Florida, an attitude essential at a position where the odds and the rules are stacked against you. 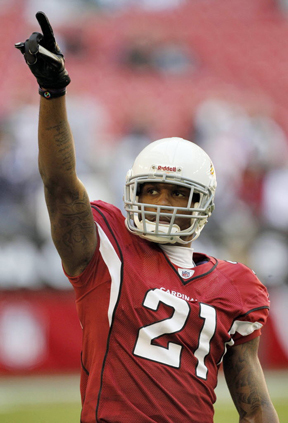 Peterson has seven of Arizona's NFL-leading 22 interceptions this season, one in each of the last four games. His pick of Matthew Stafford's pass and 29-yard return to the Detroit 3-yard line set up the go-ahead touchdown in a 38-10 victory last Sunday that ended the Cardinals' nine-game losing streak. That pick came when Stafford overthrew Calvin Johnson. Some of Peterson's interceptions have been far more spectacular. The former LSU star has a knack for appearing to be beat on a play, only to somehow catch the receiver when the pass arrives and take the football away. Peterson found out in a hurry as a rookie that God-given talent was enough to excel in an NFL secondary. Both he and coach Ken Whisenhunt said the difference between Peterson's play this year and last is technique. Peterson studied the video of last season and knew what to work on. Whisenhunt said Peterson is that rare athlete with an abundance of natural talent combined with the drive to do what is necessary to be among the best players in the NFL. The Cardinals selected Peterson with the No. 5 overall pick in the 2011 draft. While he had plenty to learn about playing cornerback at this level, he wasted no time in making an impact as a punt returner. He became the first player, let alone first rookie, to have four punt returns of 80 or more yards for touchdowns. That included a 99-yarder to beat St. Louis in overtime. But there have been no such plays this season with teams focused on pinning him to the sidelines on returns or making other adjustments to neutralize him. Arizona also has worked him into the offense on occasion, usually in the wildcat. With the worst offense in the NFL, the Cardinals could be expected to try that a time or two when they are home against Chicago. Peterson has often said he relishes any chance to touch the ball.